I see the lives of my clients reflected in the pictures, numbers, or astro chart before me and *BAM* information starts flowing in that I can offer them to make concrete changes in their everyday life and better understand their life's journey. My intention in these readings is to bring each person clarity and confirmation on where they are in their journey and what are the next indicated steps. I work with my client to ask the best questions, so that they walk away feeling more on purpose and confident. Also, my readings can help bring closure to past events by offering an objective perspective on what happened and why. If you are looking for an exact timetable on when you'll get the job or meet the perfect for you person, then my readings are not for you. I would much rather work with you on how to open yourself to sustenance and loving connection and how to invest your time and energy in what is in your best interest. Are you ready to take your life into your own hands? Do you need a kick in the pants to get to work? Can you embrace the image of you fully alive and excited about it? Yes?!? Wonderful! 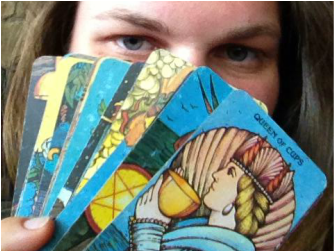 I offer readings by email, over the phone, or in-person in the sunny city of San Diego, CA. Pick the reading that fits best with your needs and budget. Tarot is the timeless art of symbology. I interpret the cards symbols for you so you receive direction and confirmation. If you have a specific question, 30 minutes of tarot can give you the answers you seek. For more broad area questions like "How will my next year go?" and "What are the strengths and lessons to be learned in my relationship? "a 60 minute session offers a comprehensive life path consultation. Email me at V@veronicah.com with a few times that work for you. Please include your full name & phone number. A picture can also be helpful! You will receive an appointment confirmation from me in about 48 hours with the number to call if it is a phone reading or directions to my office if we are going to jam face-to-face! Click your payment option below according to how much time you want and you will receive payment confirmation from PayPal in a flash. Birth Chart readings can help you more deeply understand yourself on a spiritual and material level. My readings offer you the spiritual reasons for your physical life. I am focused on where you shine, how you best create money, what kind of community member you are, what challenges you most and what is to be learned. Please be able to supply your birthdate, time, and location. Numbers are some of our most used symbols. Western Numerology uses the solar twelve month calendar and a linear interpretation of our alphabet to inform us how the numbers present in our names and birth dates affect our personality, emotions, career, health, and life purpose. This is the perfect reading for you if you are choosing to change your name or you are frustrated by challenges to your health, career, or relationship goals. Tibetan Numerology is the result of Tibetan monks listening to the sound and observing the shape of the English alphabet and assigning numbers to each letter. This system is based on a ten month lunar calendar and is most concerned with the cyclical nature of our lives. In this reading you will come to understand your internal timing cycle and how you most efficiently create and bring to completion projects and goals. You will also learn what kind of people, ideas, and opportunities you attract to your best benefit. I highly recommend both a Western Numerology and Tibetan Numerology reading before making any kind of permanent name change through marriage or other avenue.